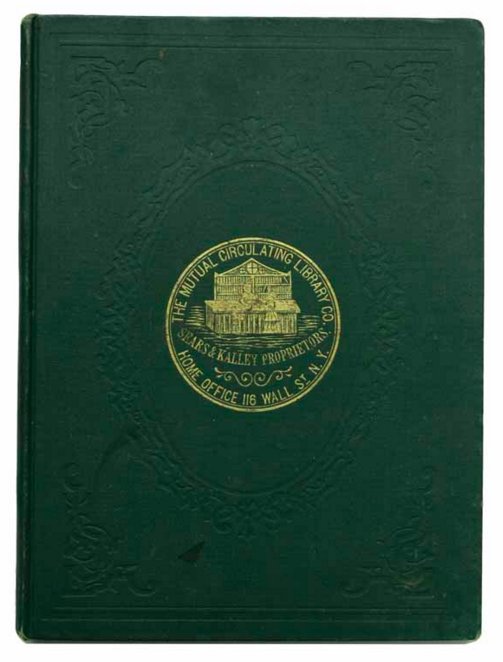 Our main lady, the lovely Kate Mitas, reports on the recent Sacramento Antiquarian Book Fair. That’s not all… perhaps I should call it (for Tavistock Books, at least) the most recent and successful Sacramento Antiquarian Book Fair. Stay tuned! Maybe I’m wrong, but I’m willing to bet that by now, if you’ve been following Tavistock’s less than stellar performance at the past three book fairs, you probably don’t really give a damn about the progress of this latest fair. All you really want to know is if we finally, finally managed to have a decent book fair, or if we’ve had to slink away with our tail between our legs yet again. Now, if this were any other book fair, knowing that wouldn’t actually stop me from forcing you to sit through this entire blog, anyway, while I regaled you with comic misadventures and newbie impressions until, at the very last minute, revealing whether or not we’d succeeded. But just this once, I’ll spare you the suspense. Because this isn’t just any old book fair: at long last, and for the first time ever in my short antiquarian bookselling career, Tavistock Books actually had a good book fair. Yeah, you read that right: we had a good book fair! We sold books! And we even made some money! Hurrah! Well, that is to say, we mostly had a good book fair. And then again, we almost didn’t. Because, in fact, we nearly gave up before we began, and the good ship Tavistock, languishing in the doldrums for so long, seriously considered dropping out of the fair circuit altogether. See? There’s always a story to tell. So, for any who are still curious, procrastinating, or otherwise willing to fritter away a few more minutes of your time: here is your tale of book fair woe and triumph, as soberly and matter-of-factly told as I can manage right now. Once upon a time, in a land rather a lot like this one, but slightly more drought-stricken, a wee lass of a bookseller-in-training traipsed off to Sacramento to work her first-ever booth at an antiquarian book fair. Let’s say, for the sake of this story, that it was a bright September afternoon in 2015, and that, although the hills and fields were brown and had been for some time, the sky was blue and cloudless and full of promise. This young bookseller and her not-so-young boss barreled up Interstate 80 in the shop’s trusty van, which was filled with what seemed like good candidates for a regional book fair: loads of Californiana and Western Americana, interesting ephemera, and, of course, helpings from some of the loveliest books in the shop’s specialties. The iron mesh door behind the front seats rattled quietly as they drove, and the side panels of the folded wooden bookcases in back occasionally let slip a muted clack whenever the van hit a bump. These sounds were oddly soothing to the young bookseller’s jangling nerves. Our heroine was but five weeks into the antiquarian book trade, then, and ignorant of the sometimes cruel vagaries of the book fair circuit. She had high hopes for the shop’s success at the fair, though she kept them to herself, not wanting to jinx it. And yet, as perhaps a few of you may recall, those hopes were thoroughly quashed by the nearly unrelenting cacophony of crickets in the Tavistock booth that weekend. 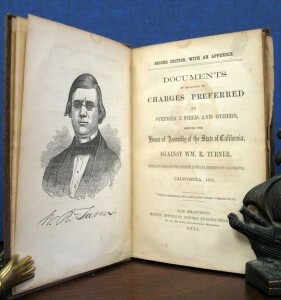 Three mournful, but plucky, blogs, two increasingly painful unsuccessful book fairs, and one wrecked van later, and the mood in the shop during the days leading up to this past weekend’s biannual Sacramento Antiquarian Book Fair was decidedly grim. A kind of preliminary dread set in. There was talk of abandoning the fair circuit. All of our books looked crummy. Never mind that a second look might at them might steal our hearts all over again — no customer would want them. It rained all week, adding to the gloomy atmosphere. In short, we had the pre-fair blues. Nevertheless, despairing naps and weeping under one’s desk are generally frowned upon at work, so, naturally, we went through the motions of packing and preparing. And while we were doing so, it occurred to me that if we kept on this way, we were definitely going to have another bad book fair. And I wasn’t having any of it, not this time. He seemed doubtful. And who can blame him? 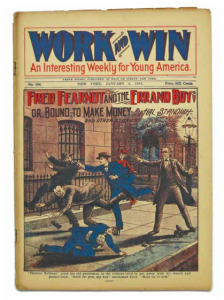 But instead of packing “The Dying Californian,” the songster that had served as my first Sacto fair’s sorry mascot, I decided to bring along our copy of Fred Fearnot and the Errand Boy; or, Bound to Make Money. Sure, maybe it was silly, but maybe it’d bring us a bit of much-needed luck, too. Plus, if things worked out, it’d make for a good blog title. “Kate Fearnot” has a certain ring to it, after all . . . Okay, if I’m honest, I can’t really take credit for the success that followed. Clouds continued to loom as we left the city, but the sun broke through around Vacaville. Thanks to Jim Kay’s tireless efforts, booth setup went smoothly, for the most part, and any flagging spirits were topped-up by free pizza in the afternoon. The company of what has become the usual crowd on the book-fair circuit was splendid, as always, and even Ms. P. (aka Margueritte Peterson) made an appearance, and may yet have room in her busy schedule for new clients for her social media/ catalogue design business. The crowd trickled in early Saturday morning, then grew quickly and remained steady throughout the day, and although not all of the booksellers I spoke with were happy, few seemed to regret having made the trek. At the Tavistock booth, we sold a range of material to both customers and dealers, ranging from a $9 children’s book (haggled down from $10 out of what, I’m sure, was merely compulsive bargaining) to considerably more expensive items, and everyone seemed happy with their purchases. Even the buying was pretty good for us. I wish I could say that it was a huge success, of course, making up for the preceding lackluster showings and then some. Certainly not enough to merit a Kate Fearnot blog title. Are they worth it then, these fairs? All that effort and agony, all the expense and risk just to gather, however briefly, with colleagues and book lovers of all stripes? Are they bonanzas, migratory communities, or refuges of a book trade that keeps losing physical stores? And what would we do, how would we swap knowledge and ideas and, it goes without saying, books, if we didn’t do book fairs? Frankly, I don’t know the answers to these questions. What I do know is that I have a catalogue to get ready for next week, and a stack of cool things to catalogue for it, and a pile of fair items to finish putting away, and a tally sheet on my desk pointing out our modest profit, in black ink, for the first time. It feels an awful lot like being a bookseller. 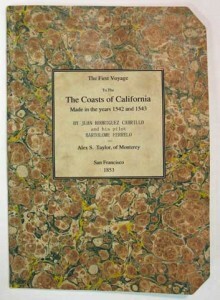 This entry was posted in Americana, Antiquarian Books, Antiquarian Maps, Book Fairs, Californiana, Collecting, Events, History and tagged Antiquarian Book Fair, antiquarian books on March 24, 2016 by tavistock_books. New News from Tavistock Books! First off, we’d like to wish each and every one of you a very Happy New Year from Tavistock Books! Whether you are a customer, colleague, pure bibliophile, or my mother and father, we have appreciated your attention and custom this past year and wish you all the best of luck in 2015! There are a lot of things happening around here in the near future, and we thought we’d send out this update from TB to keep you in the loop. 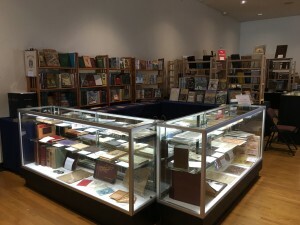 Later this January and early February features the annual California book fairs – the 48th California International Antiquarian Book Fair to be held in Oakland, CA (right near us! Check it out here: http://sfbookfair.com/) from February 6th to the 8th, and the Pasadena Book, Print, Photo & Paper Fair the previous weekend (at the Pasadena Convention Center, January 31st & February 1st). The fairs are a great chance to meet with like-minded book-loving folk from all over the United States, and both fairs will be host to a handful of international booksellers as well. Tickets are available for purchase online as well as at the fairs. Come on out and support your local booksellers! OR ELSE. Why yes, you can purchase me! Please, sir, please, I need a new home. Beaumont, Francis [1585? - 1616]. Fletcher, John [1579 - 1625]. Massinger, Philip [1583 - 1640] – Bush attributed to. BEGGARS BUSH. A Comedy. [bound with] The MAID’S TRAGEDY. 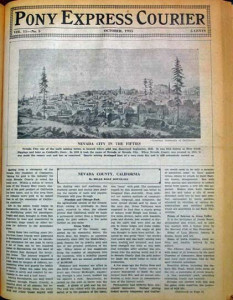 London: Printed for J. T. And Sold by J. Brown at the Black Swan without Temple-Bar. 1717. 56; 64 pp. Typographical ornaments to t.p. 4to: A – G^4; A – H^4. 8-1/2″ x 6-1/8″. Early full leather boards, with modern respiniing to style. Renewed eps. Raised bands. Red leather title label in second compartment; author label in 4th compartment. Date gilt stamped at spine base. Wear & staining to boards, with front paste-down showing faint evidence of prior damping. Paper aged, with foxing & staining. Running title occasionally closely trimmed. An About Very Good – Very Good copy. 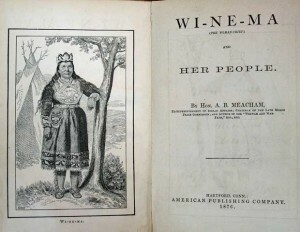 Bush: 1st edition thus, the unaltered version (NCBEL I, 1712; Tannenbaum 7). Maid: 1st edition thus (NCBEL I, 1711; Tannenbaum 293). Regarding Bush, authorship attributed to Fletcher & Philip Massinger by John H. Dorenkamp in his 1967 edition of the play. 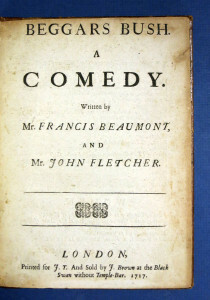 “The play is one of several works of English Renaissance drama that present a lighthearted, romanticized, Robin Hood-like view of the world of beggars, thieves, and gypsies; in this respect it can be classed with plays of its own era like The Spanish Gypsy, Massinger’s The Guardian, Suckling’s The Goblins, and Brome’s A Jovial Crew… Yet the play also contains serious aspects that have caused it to be classified as a tragicomedy by some commentators; ‘Through mixed modes Beggars Bush exhibits serious sociopolitical concerns to earn a classification that at first seems incongruous — a political tragicomedy’” (Clark, The Moral Art of Phillip Massinger, p. 116). Click on the picture to see more! And folks, despite an upcoming busy schedule for us here at Tavistock Books, we still want to take a little time to give you a short overview of what to expect in your inboxes from us in the near future. Our monthly Tavistock Books newsletter will go out next Tuesday, January 13th. 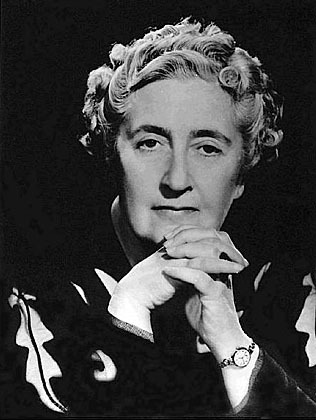 January 21st will be a large blog on the English crime author Agatha Christie, the best-selling novelist of all time (according to the Guinness Book of World Records). A list of Select Book Fair Highlights featuring a few of the items that we will be presenting at the California fairs will be announced on the 27th of January, closely followed by a small recap blog of the Pasadena Book Fair on February 3rd. Then look out on the 11th of February for our monthly newsletter once more with a large feature on the Oakland ABAA fair front and center! We do hope to see you all at the California Book Fairs later this month and early next – just remember, these are the biggest book fairs on the west coast of the United States! Feel free to contact us with any questions – and definitely stop by the Tavistock Books (Pasadena Booth #L1 & Oakland Booth #100) booths to say hi! This entry was posted in 18th-Century Literature, Antiquarian Books, Antiquarian Maps, Collecting, Events, Gift Ideas, Uncategorized on January 7, 2015 by tavistock_books. 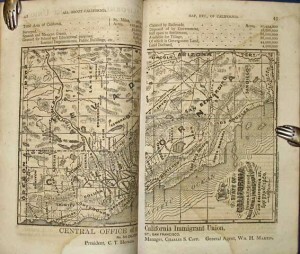 Rare book collectors often encounter maps, which present special challenges because they’ve usually been folded (and unfolded and refolded again) as part of their original use. They also make wonderful display pieces, so collectors may have to consider preservation and conservation for maps as hanging art. When the oils and salts on your hands contact the paper, they can contribute to deterioration over time. Using white gloves is one option to avoid this, but wearing gloves also reduces your ability to feel what you’re handling–which can lead to tears and other issues. Most experts agree that freshly washed, thoroughly dried hands are preferable. Always move old maps with caution; even the mount of a map can get brittle or split. Place a supportive, acid-free surface on your viewing space. That way you can lay the map on the surface and use the surface to move or tilt the map for viewing or other purposes. When you do pick up the map itself, use both hands to reduce the risk for bending, creasing, or tears. Ideally all your maps will be stored flat, in either shallow drawers or acid-free boxes. Avoid stacking them on top of each other, as acid, mold, and other particulate can easily be transferred from one leaf to another. Each item should be stored in its own folder or mylar envelope. If a map is too large to be stored flat, it can be stored in a large-diameter tube made of acid-free paper or lined in mylar. Be sure to roll your maps parallel to the enter fold, rather than perpendicular. Place items inside a metal or wooden cabinet to protect the map’s edges from bumping. Be sure to remove paper clips, binder clips, and post-its from your rare maps before storage. Metal corrodes over time, staining the paper underneath, while any acid-containing paper (such as a post-it) can cause ghosting on the paper underneath. If your item came with paperclips or other attachments, carefully document their location and other specifics before storing them separately. Because maps were (and are) frequently packaged with plenty of folds, maps are particularly susceptible to deterioration and tears along creases. While you may be able to complete very simple repairs at home, most should be handled by professionals. 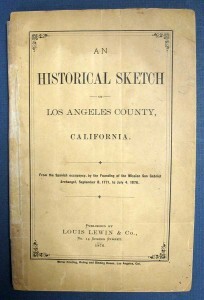 Misguided restoration efforts can drastically impact the value of your map. If your map has pencil marks or surface soil in the margins or on the verso, you can gently remove these with a soft eraser or with a dry cleaning pad and soft brush. Like books, some antique maps have non-paper components. For instance, The Traveller’s and Tourist’s Guide through the United States and Canada has a wallet-style leather binding with gilt lettering. Talk to an experienced conservator about the best ways to care for leather and other materials without damaging the paper of your map. Ultraviolet light triggers a chemical breakdown in paper. Avoid hanging antiquarian maps in direct sunlight; though glass provides some UV protection, it’s not sufficient to ensure that the document will not begin to break down. If an item is particularly precious, consider glazing the glass, which affords more UV protection. You can also rotate the locations of your hanging maps to prevent damage due to uneven light or temperature. Whenever you rotate your maps, take a few moments to examine each frame. Ensure that the bumpers and hanging mechanisms are still secure, and inspect the dust jacket. As for mounting and framing itself, these processes are best left to professionals. They’ll be well versed in using archival materials, protecting both sides of your maps, and the perils of trimming a map’s margins. A knowledgeable dealer will happily offer you referrals to excellent framing professionals. This entry was posted in Antiquarian Maps and tagged antiquarian maps, ephemera, handling rare books on June 12, 2013 by tavistock_books.